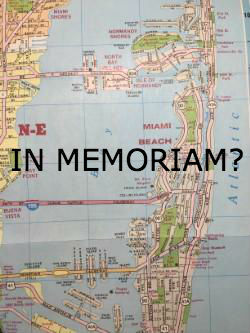 Included here are several stories and essays from a collection-in-progress, THE MIAMI STORIES. From Batista to Fidel, and on to the real enemy of the people: ¡Viva la revolución! All together, plus a few others, these pieces seem to capture, or at least corral, growing up in and around that “billion dollar sandbar,” which, alas, if my inner ear and sea legs are still in tune, is destined to return to just sandbar, if that. When? Ten years? Certainly within twenty you’re gonna need a snorkel with your straw when you hit the strip and its fancy cocktails.